See list of all accipeters - Hawks here. 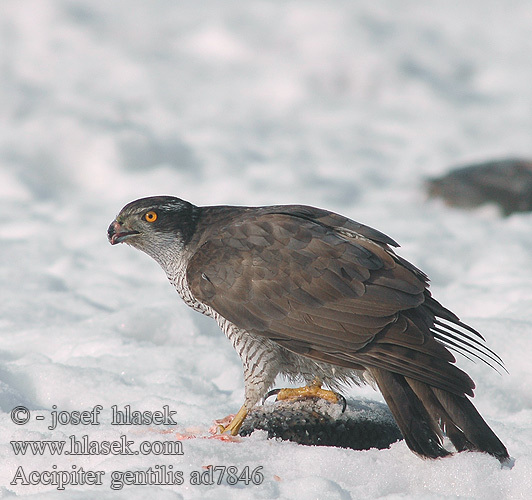 The Goshawk (Accipiter gentilis; from OE. góshafoc 'goose-hawk') is a medium-large bird of prey in the family Accipitridae, which also includes other diurnal raptors, such as eagles, buzzards and harriers. 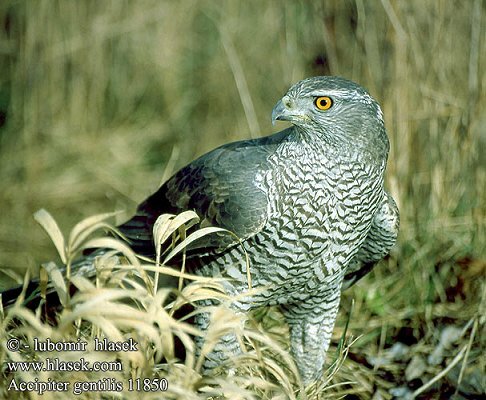 Northern Goshawk. It is mainly resident, but birds from colder regions of north Asia and Canada migrate south for the winter. This species was first described by Linn#linneaeus in his Systema naturae in 1758 under its current scientific name. 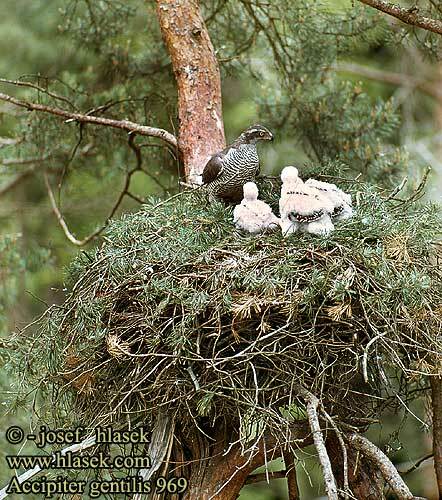 both adaptations to manoeuvring through trees in the forests it lives and nests in. 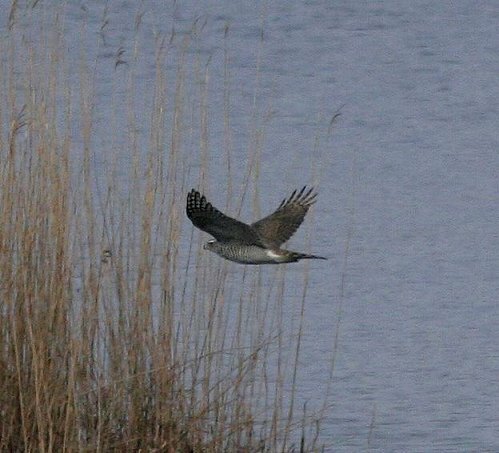 The male is blue-grey above and barred grey below, 49-57 cm long with a 93-105 cm wingspan. The much larger female is 58-64 cm long with a 108-127 cm wingspan, slate grey above grey below. Males of the smaller races can weigh as little as 630 grams, whereas females of the larger races can weigh as much as 2 kg. The juvenile is brown above and barred brown below. The flight is a characteristic "five slow flaps  straight glide". 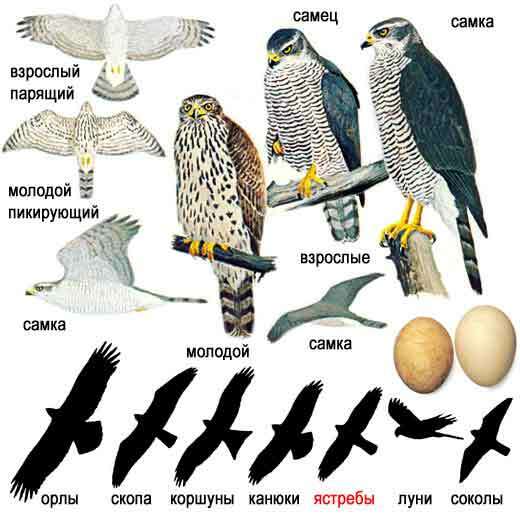 In Eurasia, the male is sometimes confused with a female Sparrowhawk, but is larger, bulkier and has relatively longer wings. but the most important prey species are birds, especially the ruffed grouse, columbiformes, and passerines (pigeons and starlings). Other waterfowl, up to the size of mallard duck, are sometimes preyed on. Prey is often smaller than the hunting hawk. secretive forest bird. At this time, the surprisingly gull-like call of this bird is sometimes heard. Adults return to their nesting territories by March or April and begin laying eggs in April or May. These territories almost include tracts of large, mature trees that the parent will nest in. 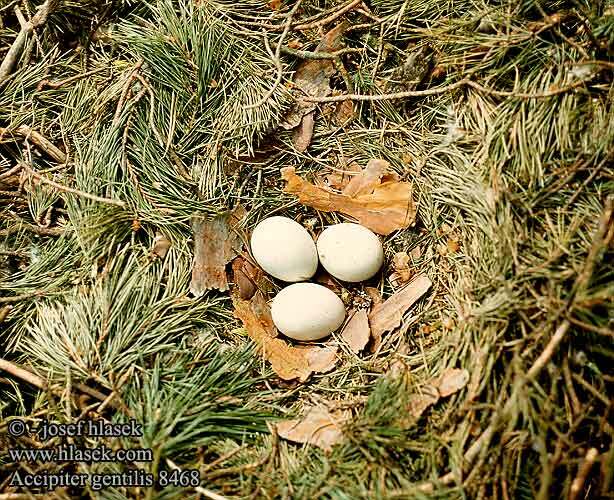 The clutch size is usually 2 to 4, but anywhere from 1 to 5 eggs. The eggs average 59 x 45 mm and weigh about 60 g ). another 10 days later. The young may remain in their parents territory for up to a year of age.